Universal's USMR-20 Series Micro-Spray Markers are designed for color coding applications where spot or stripe marks are required for identification or acceptance/rejection indication marks. These units may be mounted near automation and sensitive test equipment, placed in marking stations on the production line or attached to robotic arms. The Micro-Spray Marker is an extremely compact, lightweight, low pressure marker designed for positioning in locations where space is severely limited. Capable of marking in any attitude, it's low mass operation can apply marks at a rate of 180 marks per minute. The Micro-Spray Markers require 3-12 psi atomizing air and 70-80 psi trigger air pressure for operation. Universal USMR-20AF Micro-Spray Markers are designed to apply color coded spots or stripes on products during inspection to satisfy acceptance/rejection marking requirements. These low pressure atomizing spray markers are normally electrically triggered and can apply spot marks from 1/4" - 1" diameter on both porous and non-porous surfaces. The USMR-20AF Marker features an adjustable fluid control to regulate the amount of ink flowing into the atomizing air stream for precise control of the mark. The marker sprays an 18 degree conical spray pattern with negligible over spray. A stainless steel needle seats in the orifice after every cycle providing a self cleaning feature. 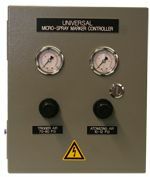 Universal USMR-20 Micro-Spray Markers are identical to the USMR-20AF units - less the fluid control adjustment feature. When these markers are fired, the needle valve opens fully and allows the maximum amount of ink to flow into the atomizing air stream. The USMR-20 Markers are normally recommended for applications where precise spot marks are not critical. Universal USM-GFR Series Gravity Feed Ink Reservoirs are available in 16 oz., 32 oz., 64 oz. and 128 oz. capacities. These heavy wall polyethylene wide mouth reservoirs are supplied with a ball type shutoff valve and a mounting bracket for easy installation. When using pigmented inks, select a reservoir which only holds a 1-2 day supply of ink to prevent pigment settling. Universal USMR-MSA-SM & USMR-MSA-TM Mounting Brackets provide 6-axis positioning adjustment for the USMR-20 Series Micro-Spray Markers. Stainless steel shafting and clamping style cross blocks enable the markers to be positioned in any attitude for hitting even those hard to reach locations. These mounts are available in both top and side mounting configurations. Universal USM-103DS, USM-104DS and USM-105DS Controllers contain all the pneumatic components required to operate the Micro-Spray Markers from electrical signals supplied by an external PLC. These controls include both trigger air and atomizing air regulators and gauges and the electric solenoids for each. The USM-103DS uses a pair of 115 VAC solenoids, the USM-104DS uses a pair of 12 VDC solenoids and the USM-105DS uses a pair of 24 VDC solenoids. Universal USM-80600 and USM-80601 Pressure Reservoirs are used to increase the ink supply pressure to the USMR-20 Series Markers. Higher supply pressure allows more ink to flow into the atomizing air stream in a given time interval. The use of a pressure reservoir enables shorter duration triggering signals to be used and results in a faster reaction time for the marker. For most applications tank pressure is set to 2-3 PSI. The USM-80600 is a 64 Oz. 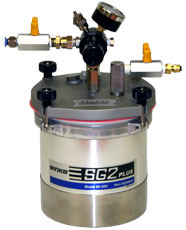 capacity unit complete with a pressure regulator, gauge and disposable liner. The USM-80601 unit is similar to the USM-80600 but includes a pneumatically operated ink agitation system which keeps pigmented inks in uniform suspension during use.